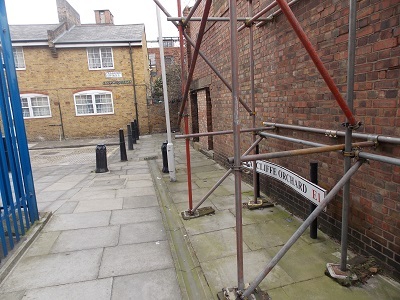 Anyone who has looked into the history of Docklands will come across the small enclave of Ratcliff or Ratcliffe which is located between Shadwell and Limehouse. 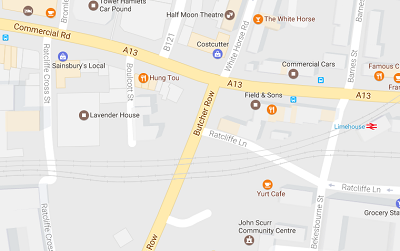 It is now a district in the London Borough of Tower Hamlets which just adds to the confusion because the new Ratcliffe is above Commercial Road whereas the old Ratcliffe was generally below that main thoroughfare. 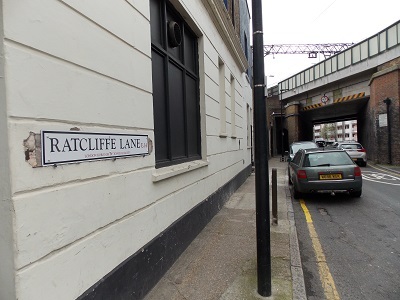 The name of Ratcliffe is probably most known for the notorious Ratcliffe Highway, the road from the Tower of London towards Limehouse and the Isle of Dogs. 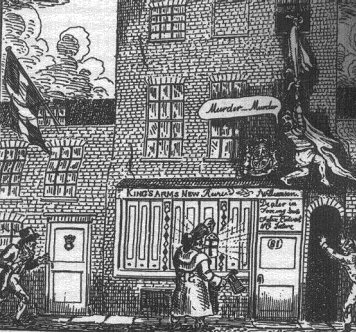 The Ratcliffe Highway was the scene of a infamous murder of seven people of 1811. The name Ratcliffe derives from a small sandstone cliff that stood above the surrounding marshes which had a red appearance, it was originally called Redcliffe. Ratcliffe from the fourteenth century was known for shipbuilding and the fitting and provisioning of ships. In the sixteenth century, various voyages of discovery were began from Ratcliffe, including those of Willoughby and Frobisher. 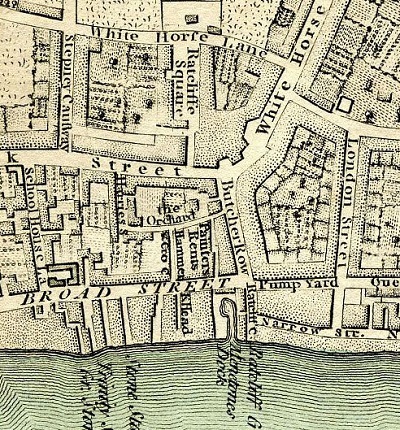 The Brethren of Trinity House made Ratcliffe their headquarters in the early 17th century before they moved to the City. One of the most interesting structures at this time stood at the bottom of Butcher Row, it was a Market Cross of considerable age which was still standing in 1732. The market that stood at this place later moved to Ratcliff Square. 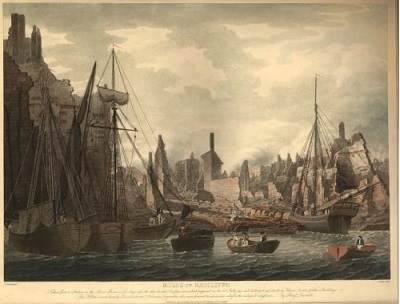 which began when a barge loaded with saltpetre exploded, the resulting fire destroyed over 400 homes and 20 warehouses and left 1000 people homeless. Although the slums returned in the early nineteen century, by the late 19th century the area was cleaned up and populated with people associated with the maritime trade. 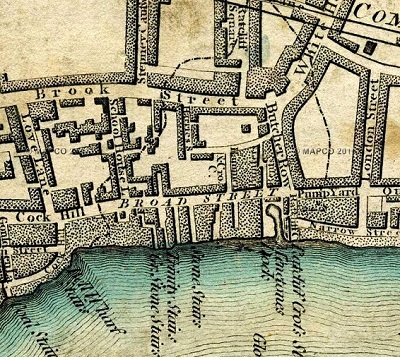 Looking at the old maps, the area of old Ratcliffe gradually became absorbed into Limehouse but it is possible to find odd references to the historic old area. The hamlet was divided between the parishes of Limehouse and Stepney until 1866, when it was constituted a separate civil parish (as Ratcliffe). From 1855 it was administered by Limehouse District Board of Works, and in 1900 became part of the Metropolitan Borough of Stepney. 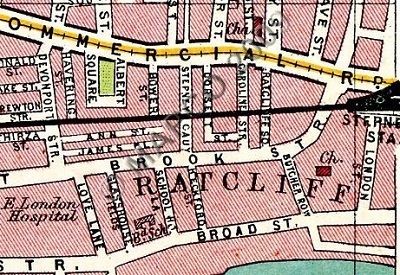 Generally the old maps show Ratcliffe occupying the land between Love Lane and Butcher Row with the boundary of Commercial Road to the north. One of the most historic slipways to the river is the Ratcliffe Cross stairs which was a crossing for centuries and the starting off point for a large number of voyages. 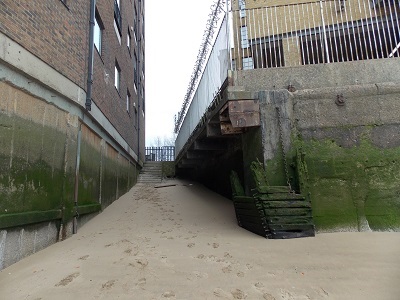 Part of the Old stone slipway to the River Thames has Grade II listing. Making your way inland you come across Ratcliffe Lane near the Limehouse DLR station. This was not really on the old maps and does not go anywhere in particular. 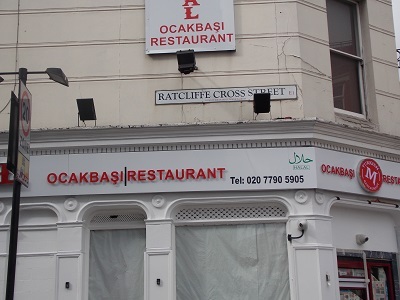 More interesting is the Ratcliffe Cross Street which runs from Commercial Road down to Cable Street, once again this is a relatively new road but is in the general area of Ratcliffe Square which was a well known part of old Ratcliffe. Not on a lot of maps is Ratcliffe Orchard which is really just a footway, what makes this interesting is that there was for a long period an orchard in the area but it was not called Ratcliffe Orchards on the old maps. The area that was known as Ratcliffe for centuries was one of the most notorious areas of the old docklands, now it is a rather strange mix of small industrial units and a few residential areas. Little remains other than place names of the place that was known all over the world has the starting place for adventures and the location of lodging houses, pubs, brothels and music halls that crowded the waterfront. Historically, the Isle of Dogs has not had many places of entertainment in the 19th and 20th century, people tended to travel to Poplar or Greenwich for theatres and shows. One notable recent exception has been the Space which is a performing arts and community centre based in a converted church. 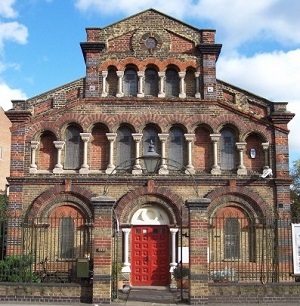 The Space is run by St Paul’s Arts Trust and puts on a large number of events per year. Recently, I was sent the details of a new modern version of Macbeth to be produced by Early Doors Productions which is an Essex based Production Company. The production reimagines the ‘Scottish play’ for a modern audience and features a gangster named Macbeth who receives a prophecy from a trio of whores that one day he will become the ‘King’. Consumed by ambition and spurred to action by his wife, Macbeth murders the current King and takes the throne for himself. Needless to say it does not end well for our hero/villain. The performance dates are 24th-27th May and tickets will be £15/ £12. Tickets can be bought through the box office number is 0207 515 7799 or can be purchased online here. As well as the attraction of the play, it is well worth visiting the venue which is one of the Island’s historically most important buildings. The former church was constructed to the design of T.E. Knightley in 1859, the foundation stone was laid by John Scott Russell, the builder of the ship “Great Eastern”. The church, St Paul’s closed in 1972 and the site was used for other purposes until the 1980’s when a locally based group of individuals created the St Paul’s Arts Trust. After a considerable amount of work on the building, a new Arts centre was created. The building has a Grade II listing and the Trust includes Limehouse resident, Sir Ian McKellen as its principal patron and is a non-profit making registered charity. 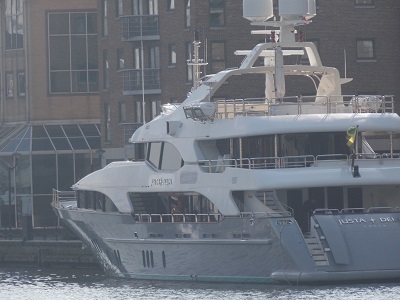 With all excitement with the St Albans visit, many people (including me) overlooked the arrival of the Justa Delia Super Yacht. 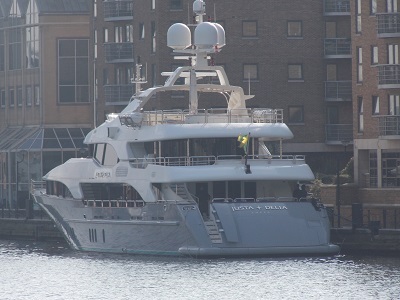 The 143.04ft /43.6m Justa Delia was built in 2008 by Benetti. 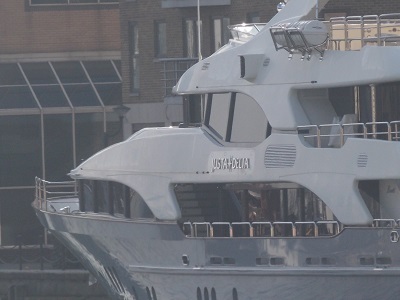 the yacht was previously named Libra Star and was sold in 2016. Built by the prestigious Benetti company, her luxurious interior is designed by Zuretti and her exterior design is by Stefano Righini. The Justa Delia’s can accommodate up to 10 guests in 5 rooms, including a master suite, 3 double cabins, 1 twin cabin and 2 pullman beds. 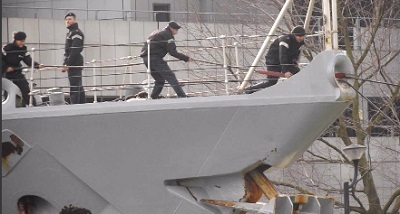 She can carry up to 9 or 10 crew onboard. 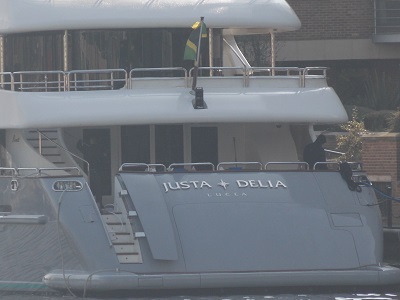 The Justa Delia’s leisure and entertainment facilities include Air Conditioning, WiFi connection on board, Deck Jacuzzi, Gym/exercise equipment and Stabilisers. 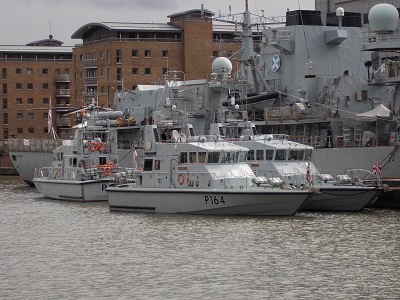 After the arrival of the HMS St Albans in West India Dock yesterday, she has been quickly joined by three patrol boats, the HMS Exploit, HMS Explorer and HMS Smiter today. 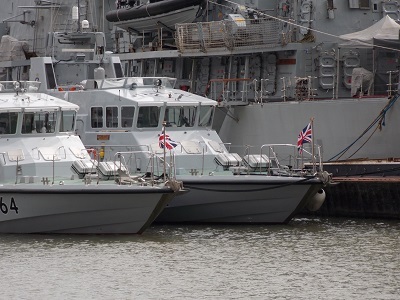 The three boats are Archer-class patrol and training vessels of the British Royal Navy and are used to train students in a range of naval skills. HMS Explorer (P164) was built by Vosper Thornycroft in 1986 and was reclassified in 1994. Its homeport is Kingston-upon-Hull and mainly operates on the East coast of the UK, particularly in and around the river Humber. The ship is primarily assigned to the Yorkshire Universities Royal Naval Unit (URNU), serving the universities of York, Hull, Sheffield and Leeds. HMS Smiter ( P272) was built by Watercraft Ltd in Shoreham and commissioned in 1986. Her primary mission is to support the Oxford URNU’s activities but the vessel also conducts other RN tasks. Oxford University Royal Naval Unit (URNU) was formed in October 1994 to provide training to undergraduates from Oxford, Oxford Brookes and Reading Universities. 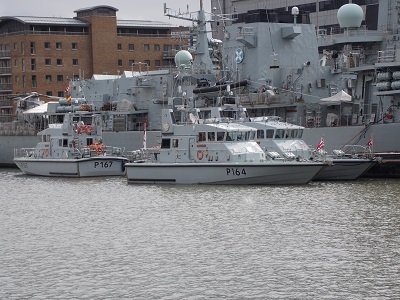 HMS Exploit (P167) was built by Vosper Thornycroft and commissioned in 1988, the ship is berthed in Penarth, near Cardiff. 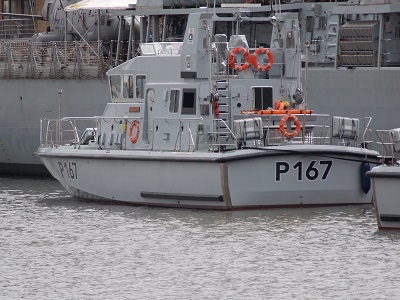 HMS Exploit is the Birmingham University Royal Naval Unit’s Training Patrol vessel, although the unit covers a wide area, taking undergraduates from eight Universities in the region including Loughborough and Warwick. Archer-class patrol vessels have a Length of 20.8 m and beam of 5.8 m and often carry a crew of 20 (training) and 12 (operational). 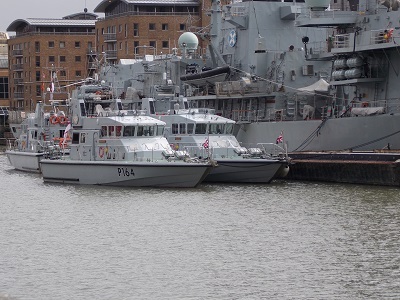 It is not known how long the patrol boats will be in the dock but the St Albans is on a four-day stay. 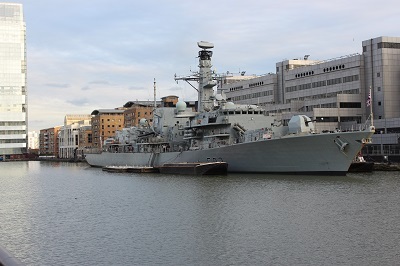 After a relatively quiet period in West India Dock, we welcome the return of the HMS St Albans who last visited in July 2015. 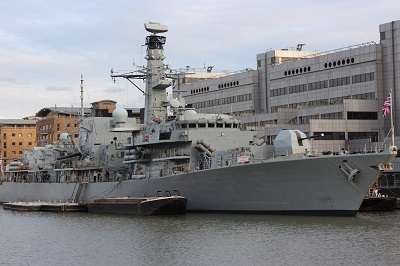 HMS St Albans is the 16th and last of the Royal Navy’s Type 23 frigates to be built and was launched on 6 May 2000. Constructed by BAE Systems at Scotstoun, she was delivered to the Royal Navy in November 2001. She is based in Portsmouth. The St Albans has a length of 133 m (436 ft 4 in) , Beam: 16.1 m (52 ft 10 in) , Draught: 7.3 m (23 ft 9 in) with a crew of around 185 . The ship has had an interesting history, in 2006, she picked up 243 evacuees from the dock in Beirut and safely transported them to Cyprus. 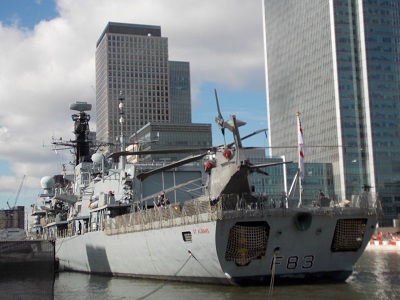 Like many Royal Navy ships she has been deployed around the world included supporting international efforts in tackling piracy, illegal trafficking, and smuggling. 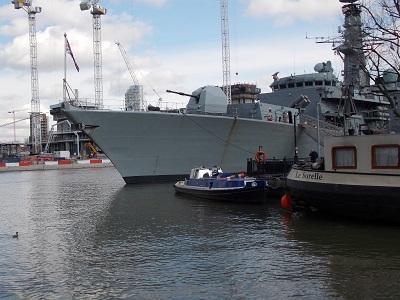 In May 2013 she was handed over to BAe Systems for her refit in Portsmouth Harbour, where she remained until 2014. After intense trials she rejoined the fleet. More recently, in January 2017 she escorted the Russian Admiral Kuznetsov carrier task group through the Channel. 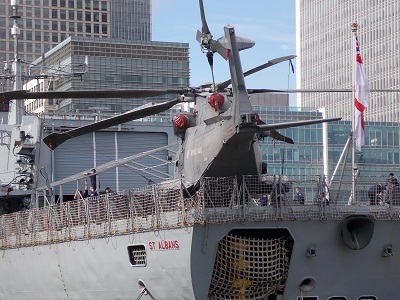 The St Albans is on a four day visit to West India Dock, last time the ship was open for the public to visit, however the ships plans are not known at this stage. The post about the recent centenary of the Silvertown explosion was a reminder to write about another tragedy that happened a century ago. 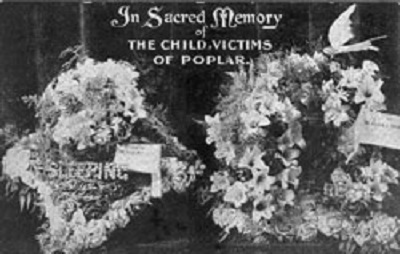 This tragedy involved a Poplar school and children who were victims of one of the early bombing raids on London. Although the first air raids on Britain were from German airships, these tended to be short and sporadic. However in late 1916, the German Air Force formed an ‘England Squadron’ commanded by Captain Ernest Brandenburg which undertook a bombing campaign designed to strike terror into the British population. The campaign saw the squadron’s Gotha G.IV and R.VI Giant bombers conduct raids across the country. The worst raid in terms of casualties took place on the 13th June 1917 and involved 20 Gotha bombers attacking London; when the raid had finished 162 people were killed and 432 injured. 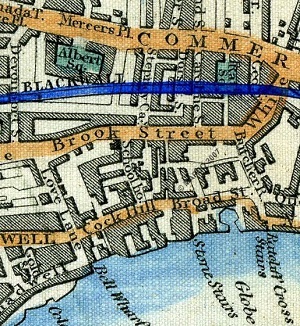 The East End of London was one of the places the Germans targeted especially around the Dock areas. On the 13th June, In the East End alone; 104 people were killed and 154 seriously injured. One of the worst incidents involved a bomb which entered the Upper North Street School in Poplar and exploded killing 18 young children. The pupils who were killed were mainly between the ages from 4 to 6 years old. 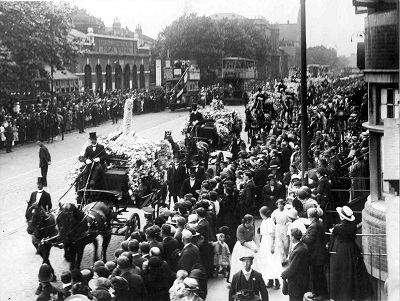 Around a week later, one of the biggest funerals ever seen in London was held for the children. Fifteen children were buried in a mass grave at the East London Cemetery, while the other three children were buried in private graves. A newspaper report gave details about the ceremony. Child Victims of London Air Raid. Seventeen Little Coffins, covered with pink and white blossoms, seventeen little coffins—-some of them pathetically small—lay in a row before the altar of Poplar Parish Church, London, on the 20th June. Sixteen of them held the bodies of sixteen child victims of Germany savagery, school children who were killed in the daylight raid. In the seventeenth coffin were broken fragments of two other little bodies. 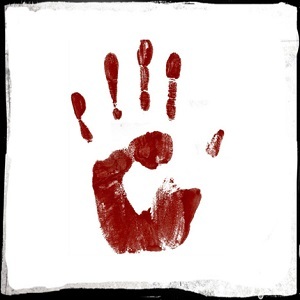 Seated amongst the mourners were many little boys and girls dressed all in black, with tense white faces, the brothers and sisters of the dead. 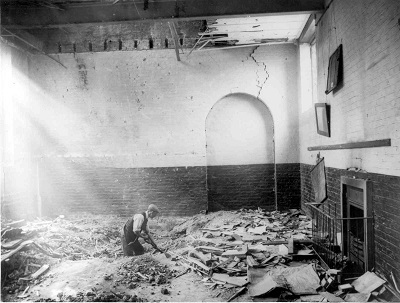 Some of them (says the London “Daily Express”) had themselves been extricated from the medley of powdered brick, wood, and human flesh and blood in their school building after the bomb exploded. 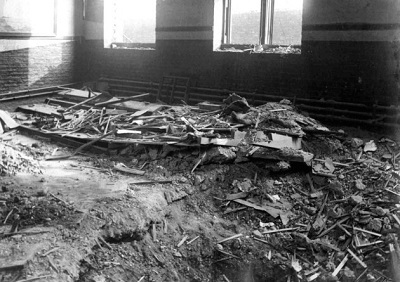 The eighteen children—fourteen of them were aged only five—were all killed in their classroom at a London County Council school on Wednesday, 13th June, by a bomb dropped by a German airman. Children took a large part in the funeral ceremonies. Boy Scouts and Girl Guides made an aisle on the church steps, cadets in khaki from the secondary schools lined the road in front of the church, and at the end of the service the band of boys from the Poplar Training School played the “Dead March,” and, later, a special funeral march composed by their conductor. Although the tragedy has largely been forgotten, at the time it was widely used by the newspapers and government for propaganda purposes and encouraged anti-German sentiment, often the newspaper reports had lots of gory details. Whilst people accepted atrocities on the battlefield, air-raids breached the boundary between soldiers on the battlefield and civilians at home. It was the first time that people began to understand the concept of total warfare. A memorial in Poplar Recreation Ground, unveiled in June 1919, bears the names of the 18 Upper North Street School pupils that were killed.